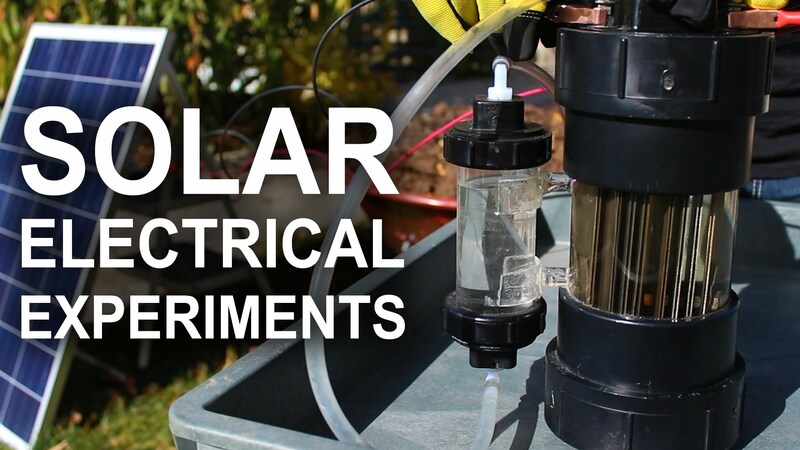 5 random experiments with solar electric energy, ranging from charging smartphones and making hydrogen powered bottle rockets, to sparking plasma arcs and even starting a fire. These experiments and results are portrayals of my own attempts and experiences, and are accurate to the best of my knowledge. Your results may vary depending on your location, experience, and modifications to project ideas. There are risks associated with some of these projects that require adult supervision, and possibly others that I'm not aware of. Use of this video content is at your own risk. This gas is perfectly balanced for a powerful reaction, and when ignited, turns back into water. There are no by-products that are harmful to the environment. The process can be repeated over and over, and the gas is very powerful. Rather than using a charge controller to charge a battery bank, I wanted to see if I could hook the panels directly to a cheap inverter to power devices on the fly. It seemed work just fine for charging my phone, but I did have to hook the inverter to a car battery to get it to power anything more substantial, like the battery charger for my cordless drill. It really surprised me to see the juicy electrical arcs between the terminals. I wasn’t expecting to see a sustained plasma arc just from 2 panels in parallel. I’m still not exactly sure how it did that with such low voltage, but it was really cool to witness. Overall, I’m a lot more interested in solar power now that I’ve been able to play with it a bit. I can see the value in it, and now that my feet are wet, I’m a lot less apprehensive about getting deeper into it in future projects. Good morning everyone! What part of the world are you all watching from? You would need a lot of high pressure gas for it to really be worth making. That’s still not a Hydrogen cutting torch. +Grant Thompson – “The King of Random” how about now ??????????????????? +The Baconator look out, it’s the grammar police. you’re a teacher, right?